Millet's rural images must be understood in the context of societal transformation after the Revolution of 1848 in Paris. In the political upheavals of that event, peasants emerged as symbols of a simpler, preindustrial life, and for intellectual radicals they also embodied aspirations for social change in an urban, industrial world. Fleeing the turmoil of Paris in 1849, Millet moved to the village of Barbizon to devote his energies to rendering scenes of the country. The present drawing was stimulated by one of the artist's rare trips to other locales, a visit to his Norman birthplace of Gruchy in 1854. This rather finished work is one of several that he made in the following years, all leading up to a painting of 1864 (Art Institute of Chicago). Combining a naturalism born of direct observation with submerged references to classical and biblical themes in earlier art, Millet elevated genre scenes to a high level of seriousness. In their ponderousness and almost ritual solemnity, this group of farmers carrying a newborn calf resembles processions in paintings by such earlier masters as Nicolas Poussin and Pieter Brueghel. 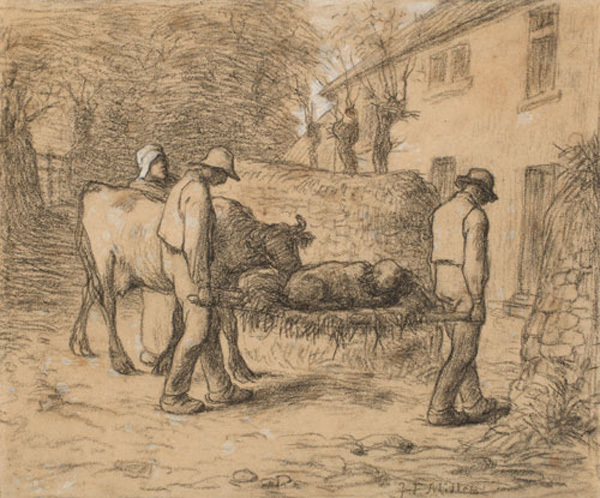 Although the painter's champions interpreted his pictures as emblems of hope and as tools of social reform, Millet himself viewed the peasant as fatally trapped in an oppressive cycle.